Crisis management (CM) is often confused with business continuity management (BCM). For those who had attended the institute’s BCM certification courses, you begin to notice that organisation need to increase its preparedness not only to manage a disaster but also to a crisis. Crisis does not only include physical threats but also incidents that affect the reputation of the organisation even though you still have access to your organisation. 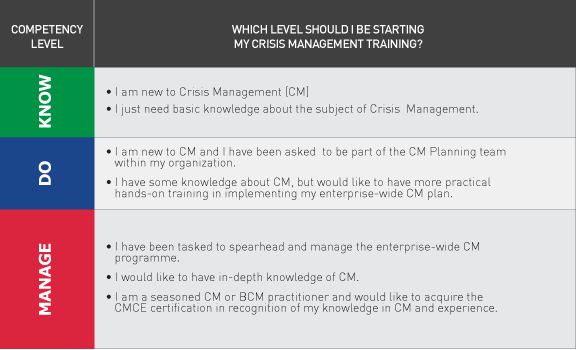 With the advent of social media and real-time updates, BCM professionals and senior management need to be crisis management aware and these courses because of the basic necessity for any senior management team members’ responsibilities. Noting that not everyone has the same level of interest, experience and job scope, BCM Institute has since designed various crisis management courses to cater to their unique backgrounds. Singapore’s WSQ Statement of Attainment through any of our crisis management (CM) competency level course. Personnel tasked to update and upkeep their crisis management plans and would like to be internationally recognised can look forward to enrolling in any of our 4 certification courses. 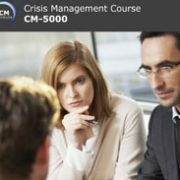 This advanced 2-Day crisis management (CM) course is a follow up to those who have attended the CM-300 Crisis Management Implementer course. Here, participants will be taught the how to manage a crisis management flow of events as well as conducting advanced level testings such as integrated and simulation exercises. For Singaporeans and Singapore PR who would like to take advantage of th SkillsFuture Singapore fundings, they can look into BCM Institute’s easy to digest, bite-sized, 3 and 2-day competency based crisis management courses. 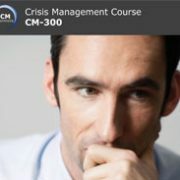 This 3-Day intermediate crisis management (CM) course takes participants through the fundamentals of BCM and how it relates to crisis management before allowing participants to learn about the different types of crisis and how to deal with them. This 2-Day advanced crisis management (CM) course takes participants through the different types of crisis handling strategies as well as tests that can be administered to see the robustness of their crisis management plans.